As part of the Rockbound Highland Home Program, WPAOG is working in partnership with the West Point Department of Emergency Services (DES) to pre-qualify Alumni for access to West Point. Every visitor* that does not have a DoD-issued identification card will need a special visitor pass to access post. For a full list of identification requirements, please visit U.S. Army Garrison West Point’s Visiting Us page. West Point Graduates have the opportunity to bypass lines at the Visitor Control Center (VCC) by filling out a secure online form in advance of your visit, allowing West Point to conduct the background check before you arrive. Alumni must apply for a Grad Pass at least three days prior to arrival but no more than 120 days. There are two types of Grad Passes for which you can apply using the secure online form. 1. 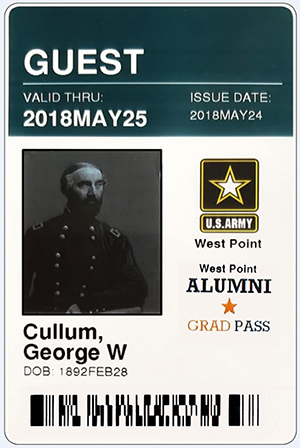 Temporary Alumni Pass (no photo required) – If your visit to West Point will be less than 14 days, select the “Pass” option on the secure online form. 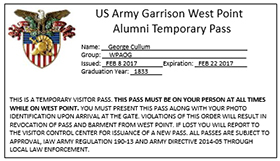 Upon arrival to West Point, your Grad Pass will be available for pickup at Thayer Gate. 2. Local Area Credential (LAC) (photo required) – If you visit West Point more than once a year, we recommend you select the “Badge” option on the secure online form to receive a Grad Pass that is good for one year. Upon arrival to West Point, proceed to the VCC to have your photo taken for your Grad Pass, which is issued on the spot. Graduates and their families will receive priority preference through the “Alumni Lane” at the VCC, similar to how frequent flyer club members do at airline check-in. Click here to access and complete the secure online post access application form. You must first log on to the WPAOG website with your username and password. If you have forgotten your username or password to the site, please click on “Forgot Your Password/Username?” You will receive an email notification with instructions to reset your password. If you have difficulty logging on, please contact 845-446-1622. Upon submission, the form will go directly to DES, which oversees the security review. You will receive an email confirming receipt of your application. If you do not receive further correspondence from DES, then your application was successfully processed. Be sure to print your email confirmation, and bring it with you when you visit. If you applied for a Temporary Alumni Pass, bring the printed confirmation email to Thayer Gate. The first gate guard will direct you to the search area – the second, covered checkpoint – where you will use the non-DoD lane. Present the confirmation email to the gate guard who will exchange your email for a paper pass. If you applied for a LAC, go to the VCC near the West Point Museum, and bring the printed email confirmation to the “Alumni Lane” at the VCC. Your photo will be taken, and a LAC will be issued. You may then proceed to enter West Point through any gate. *Note: If you are travelling with others, each person 17 years of age or older must obtain their own pass or badge. Complete a separate form for each individual who will need a pass. Moving around West Point: Since parking is extremely limited at West Point, consider using the on-post SMURFF Shuttle Service (Blue Bus). The SMURFF is free to everyone on or visiting West Point. The shuttle is available between the hours of 7:00 a.m. and 6:00 p.m. Monday through Friday except Federal holidays. The shuttle arrives and departs from its designated locations approximately every 15 minutes. Visit westpoint.ridesystems.net for more information. To track the shuttle from your smartphone, computer, or other device, download the RideSystems App and select “West Point” in either the Google Play Store or Apple App Store.